Everything begins with a shift in perspective from viewing stakeholders as a separate entity, “us vs. them,” to a singular view of “us ” as this enlivens a new era of community-focused marketing and engagement. Social media introduces a new problem of sorts, one where the answer is lost in the politics and corresponding burrows of debate as to who owns social media within the organization. As brands venture into social networks, many are unwittingly contributing to the dilution of their brand image, value proposition, and mission amongst a new genre of social customers and influencers. The mission and vision statements of old no longer convey authority or inspire conviction in an era where the audiences to which we are trying to connect now possess audiences of their very own. The ability to connect with someone and inspire them to take meaningful action is in direct competition with the actions of social customers who are intentionally or indirectly building communities around their views and interests. In my work, I’ve uncovered what I call the Last Mile or Last Kilometer of Social Media, a challenge that will face every business in the attempts to engage with consumers and influencers and impede the cultivation of dedicated and flourishing online communities. The last mile is a term associated with the cable and internet provider industries, representing the final leg of delivering connectivity from a provider to a customer. It is symbolic of the human connection required to take a service from the connection hub in any given neighborhood to the home of the new customer. At the moment, a disconnect exists between the brand, its representatives, and consumers in social media. Representatives on the front lines in social media are arguably unversed in the elements that define the brand persona, purpose, and value. It’s also highly plausible that many of these representatives are not immersed in the challenges and options that face the people to whom they’re trying to connect and recruit. As a result, their actions and words are diluted through the reinforcement of individual personality traits that don’t match, convey, or strengthen the characteristics or voice of the brand they represent. While their engagement is mostly transparent and authentic, they are not genuinely empathetic in acknowledging or addressing the needs of their communities because they have not lived a day in life of their consumers. Simply said, the personalities of each representative eclipse that of the brand they represent and without realization, the two can work against each other over time. The brand team along with executive management is either slow or reluctant to adapt what was once the brand story and mission in traditional media and communications and modernize and humanize it for an era of interactive and social relations. For example, if the brand were a person, whom would it resemble? What does it sound like? What are its mannerisms and stature? What are its convictions, beliefs, and passions? Essentially, what are the persona and characteristics of the brand and what does it represent today and tomorrow? More importantly, how do we align the personalities of our representatives with the character of the brand? Companies are not intentionally adapting brand style guides for the social web and in turn, empowering their representatives through training and reward. Instead, they’re simply guided by social media guidelines and policies, if that. Social media is, for the time being, viewed as a single entity, where the whole is greater than the sum of its parts. When we talk about a 360-degree approach with social media completing the rotation, we relegate participation and conversations to a means for intermittent engagement, but not as the complete solution for 360 business processes and mechanics. For example, companies are structuring social media around a function, but not necessarily as an extension of existing business practices. In some cases, customer service is at the forefront of listening and engagement; in other scenarios, marketing or communications is leading the engagement; and in alternative situations, advertising is controlling the creation and dissemination of the story. Social media is not served by any one role however; it represents the opportunity and need to socialize the entire organization. As is, the consumer in the various roles they play in our ecosystem, are largely passed over as a result of an infrastructure that doesn’t recognize their social existence and the parts they play in the definition of our markets over time. I believe that any division of an organization affected by outside activity will require a socialized approach, whether it’s simply monitoring or more likely monitoring, engaging and adapting. 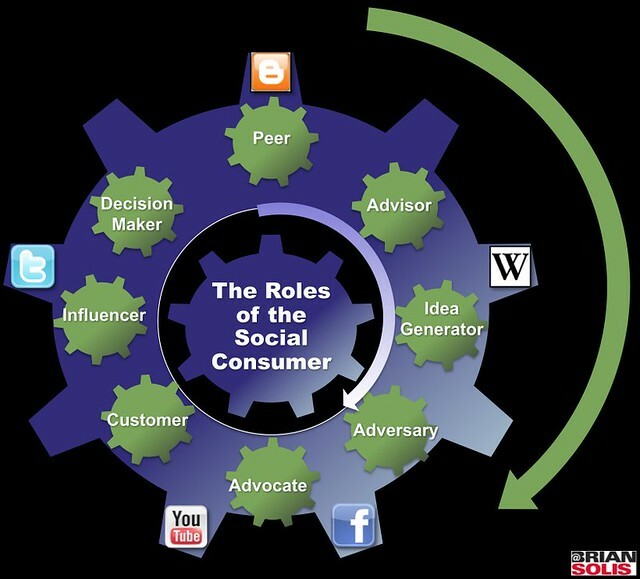 The Last Mile of Social Media is solved by “connecting the brand” and its purpose, value, intent, and voice with the consumers in and around the diverse roles they play in the business ecosystem. It supported by a methodology and framework that proactively and reactively connects representatives and value to people of interest in their “social” homes. Ring of Representatives: The outer ring is orbited by brand representatives from various divisions. 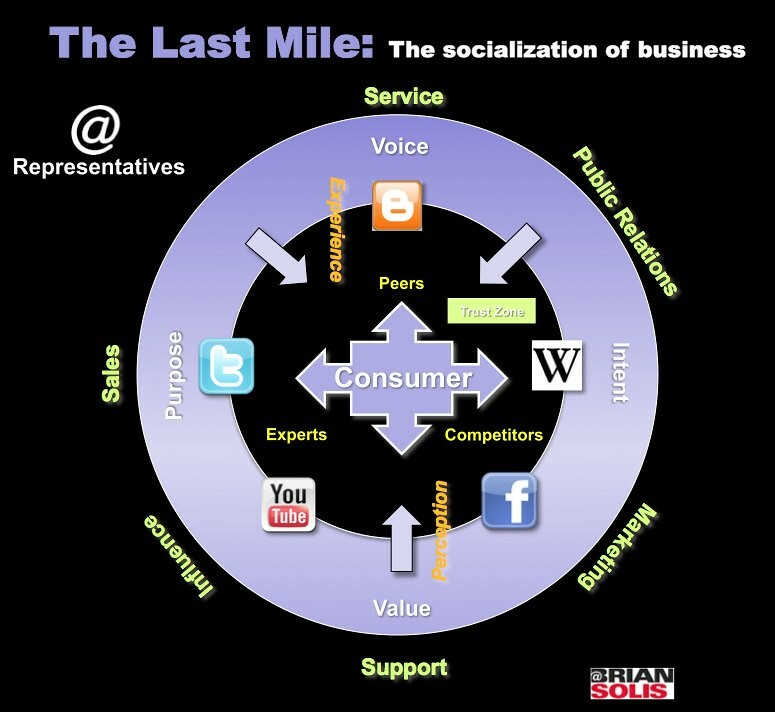 The Last Mile: Representatives are connected to consumers based on needs, challenges, and opportunities unique to business processes and functions. The interaction is a seamless extension of the company purpose, value, voice, and bonded through genuine intent and engagement. The Consumer Hub: A cushion between the “Last Mile” and the consumer is padded by a trust zone that is developed around each consumer and dictated by the experiences with your product/services and fortified by the communication and engagement of your brand team, those of your competitors as well as their peers. 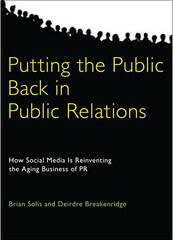 Their experiences lead to perceptions and impressions that are in turn expressed through their social networks. The Last Mile creates human connections with the mixed roles of the social consumer, one that brings to life the brand persona, purpose, and understanding through person-to-person interaction outside of the brand’s domain. The socialization of business then creates a unique bond between people and a more humanized and approachable brand icon, reinforced through informed, purpose-driven engagement. UPDATE: Please read Josh Hallet’s excellent thoughts on The Last Mile published this January.